The following review is the first guest post that I have included on ‘A beauty junkie in London’ so I hope you enjoy it! … and I know how you blog peeps love a good giveaway! Anyway, read on for Katie’s review of the Clinique Instant Lift for Brows…. First of all I’d like to say a massive thank you to Beauty Junkie in London for letting me guest review this product! I’ve really enjoyed testing out this product and I hope you all enjoy my review! First impressions of the pencil were great. 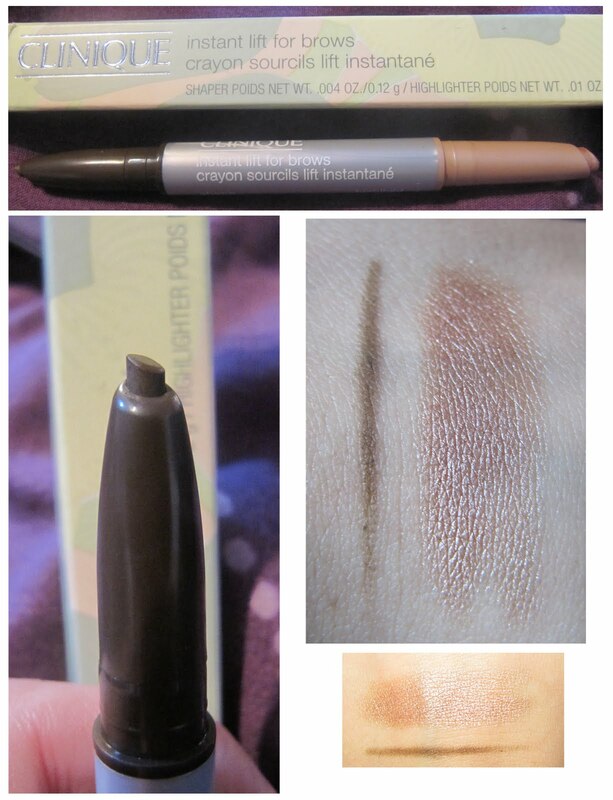 I have very dark eyebrows and haven’t before found a colour that matches them perfectly without being too dark, or too coppery brown, and I also always highlight my brow bone to give some definition, so I was very excited to try this as it is a pencil and highlighter in one. The packaging is perfect, a sleek pencil with each applicator at each end – it certainly saves carrying a pencil and a highlighting shadow separately.I adore the pointed tip on the actual pencil (As seen in the pictures), this makes application very easy to get thin small strokes on my brows and it avoids leaving me with big noticeably drawn in smudges. The colour is perfect for my brows (for once!) and I have been using this every single day since! The pencil lasts well, meaning I don’t need to reapply through out the day. On to the highlighter – I was SO excited for this part of the product, but I was let down by the colour. As this pencil was for dark eyebrows, I think Clinique assumed they would need a dark highlighter to match, but as I am quite pale, the coppery brown shimmery cream really stood out and looked quite unflattering on my brow bone. I haven’t used the highlighter much for that reason, but I have used it as an eyeshadow base and it really works wonders for this. Once you apply the creamy highlighter, it doesn’t budge, which is perfect if you are a busy bee without time to re-apply through out the day. I think a silvery/gold highlighter colour would have been better instead of a coppery orange shimmer, but that’s just my opinion. You can see in the pictures without, and with the product, my eyebrows on a whole certainly look more tame and shapely (I didn’t even use an eyebrow comb for these pics!). I really love the pencil and would recommend it for staying power and ease of use of product, although I will still have to carry a separate colour for highlighting. Thank you for your review Katie! Don’t forget to visit Katie’s blog! This product was sent for review purposes – all opinions are that of the guest blogger. Next Post Golden Touch Facial at Neville Salon, Belgravia. The brows look fabulous but have to agree the highlighter is a bit too dark, bet it would look fabulous on people with olive skin tones though.